One of the patients that received a courtesy phone called today to wish me a Happy Valentine’s Day. During the home visit Pam and I made, he talked in a barely audible whisper. Today he had a strong and vibrant voice. Watch the short video below to see Alice Stollenwerk Petrulis, MD, FACP discuss the Red Carpet Care program. 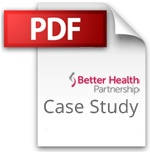 Click on the image below to download the Red Carpet Care Program case study (PDF). Better care and lower costs for "Super Utilizers"
Patients with complex needs are typically the biggest utilizers of high-cost care. It’s well understood that the sickest 5 percent of the population account for 60 percent of health care costs. That’s why the Better Health Partnership led an initiative with providers, insurance companies and community organizations to develop Red Carpet Care, a patient-centered coordinated care program that provided an advanced level of care to deliver greater value for patients and payers. With grant support from the Robert Wood Johnson Foundation, Better Health Partnership helped the MetroHealth System establish Red Carpet Care clinics within two of its Family Medicine practices in December 2012. Each was staffed by a dedicated nurse care coordinator who organized patients’ care and addressed acute care needs. All 130 patients invited to participate had ties to MetroHealth and insurance coverage with Medical Mutual of Ohio, a commercial insurer, or Buckeye Community Health Plan, a Medicaid managed care plan. The insurance companies provided financial support for the care coordinators and agreed to share savings that were realized from patients’ reduced use of costly health care services. Red Carpet Care enrollees also benefited from community partners -- West Side Catholic Center and University Settlement – which helped patients with a variety of human services. Every week, the care coordinators, insurers’ case managers and representatives of the community organizations met to discuss enrollee challenges to better use their collective resources to overcome them. The program delivered estimated savings of $317,000 over one year of continuous enrollment for the 67 participating enrollees of Medical Mutual of Ohio. In addition, Red Carpet Care enrollees generally did better on quality measures for diabetes and high blood pressure than a group of similar patients who were not in the program. Compelling evidence of success also was clear in the stories that Red Carpet Care participants recently shared about the program’s impact on their lives. Compelling evidence of success was clear in the stories that Red Carpet Care participants shared about the program’s impact on their lives at a graduation party. A 30-year drug user had been clean for nine months, an achievement she credited to her Red Carpet Care nurse care coordinator. A patient with diabetes and other health problems hadn’t taken her insulin in two years, but she was back on all her medications and lost 150 pounds in Red Carpet Care. A patient with "off-the-chart" high blood pressure, whose first introduction to Red Carpet Care came during a hospitalization, is now stable, no longer needs diabetes medication, dropped 65 pounds, works out regularly and is fully engaged in her health. She credits her nurse care coordinator and her insurance company’s case manager. Buckeye's Red Carpet Care enrollees were provided cell phones and the phone numbers of the two nurse care coordinators who had cared for them, allowing direct contact without long waits on hold. The care coordinators used registries to proactively follow up with patients and provide home visits when the enrollees needed care but could not travel to the medical office. The nurse care coordinators met weekly with the health insurers’ case managers to reduce duplication of services for patients, collaborate and combine resources to meet patients’ needs and assist each other in navigating their respective organizations. Care coordinators helped patients schedule multiple appointments in single trips and get needed medical equipment and mental health visits. Many times, in addition, care coordinators simply served as friendly voices, checking in to make sure patients were doing OK. Interested in starting a program to improve care and reduce costs for "Super Utilizers?" Contact info@betterhealthpartnership.org.